This round seems to be going a little differently. Instead of fairly steady progress, I’ll make little progress for 2-3 days and then I’ll drop over a pound all at once. The scales were down 1.4 pounds yesterday so I wasn’t surprised when they stayed the same today. I also played enough tennis to make my legs tired last night, and that seems to slow things down temporarily. But, overall in 14 days (not counting the loading days) I’ve lost 8.6 pounds. Not bad. Not bad at all. I started taking a fruit serving to snack on mid-morning, and I haven’t had any blood sugar problems since. I don’t miss the fruit snack in the afternoon so this seems to be a good solution to my noon time blood sugar drops. Generally I’m feeling very good and things are going well. I see other blogs on here written by people trying to lose weight. I see references to serious exercise programs, serious diets, enormous willpower to stay with the program and I just want to holler – There Is An Easier Way!! I know nothing is the right thing for everyone but after doing the diets and exercise and anything else I thought would help without success, I am a huge fan of HCG! 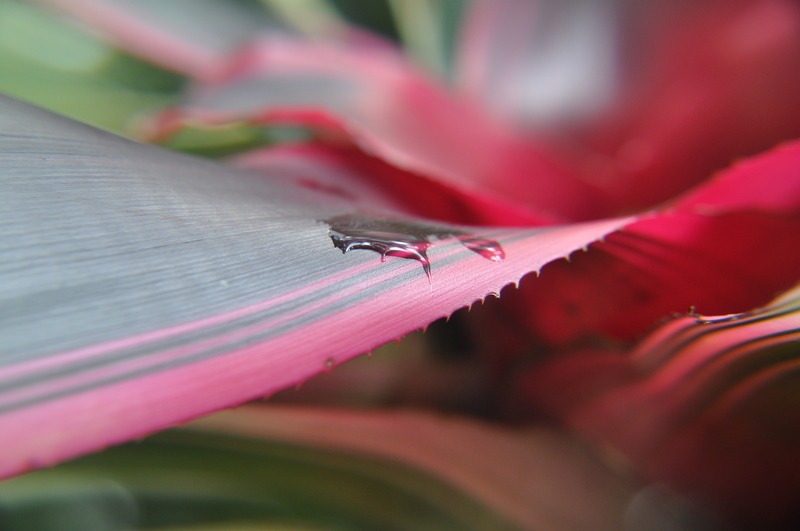 This is a pic of a water droplet on a bromiliad leaf, uploaded so my new theme can use it on the main page. My husband took this photo with a magnifying lens.